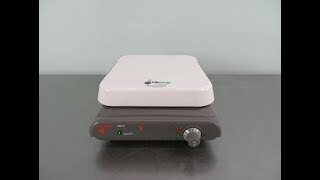 The Corning PC-610 Magnetic Stirrer provides a compact, low profile instrument with powerful, consistent stirring and easy to use analog controls. This magnetic stirrer comes with a bright white 10 x 10-inch glass ceramic blend top and can stir large volumes of liquid with ease, up to 10 gallons. Heavy duty motor and closed loop stirring control with a stronger magnet, improves the coupling with the stir bar and overall capability. The two-piece construction of this lab stirrer channels away liquids in the event of a spill, protecting the electrical components. At the rear of the PC-610 is a mount for a support rod for use with additional instrumentation such as a pH/mV meter. This Corning PC-610 Magnetic Stirrer has been fully inspected and is ready to ship, please note there are cosmetic blemishes (pictured) in the paint at the rear of the stirrer, they do not impact performance in any way. All of our lab equipment comes backed with our standard warranty. Should you have any questions, please don't hesitate to contact us.